The VWR Gravity Convection Incubator provides a reliable heated environment with gentle airflow, ideal for delicate samples, microbiology and bacterial research, as well as food and beverage testing. This VWR Incubator uses gravity convection, which won’t dry out samples and is a great choice for open containers or plates. This 4-cu ft lab incubator has an easy to clean polished stainless interior, with sturdy adjustable shelving, and a tempered glass door that allows users to check on their samples without disturbing the environment. The VWR Microbiological Incubator has a temperature range between 5° above ambient to 75 °C, that can be set easily from the upfront digital panel where users can also set and silence alarms and monitor conditions and offset times. The Gravity Convection Incubator also features over temperature protection with dual sensors, and connection to standard RS-232 interface to a computer. 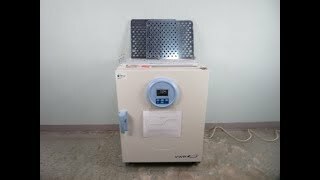 Incubator is a brand new out of the box unit. Instrument has been fully tested by our service team with a clean bill of health. This 2017 VWR Gravity Convection Incubator CAT# 89511-420 is a brand new out of the box unit. Instrument has been fully tested by our service team with a clean bill of health. All of our lab equipment comes backed with our standard warranty. Should you have any more questions about this of any of our other incubators, please don't hesitate to contact us.